Hydrocodone-Acetaminophen Overdose is the excessive intake of one or more medications containing hydrocodone and acetaminophen, intentionally or by accident. What are the Causes of Hydrocodone-Acetaminophen Overdose? What are the Signs and Symptoms of Hydrocodone-Acetaminophen Overdose? The signs and symptoms of Hydrocodone-Acetaminophen Overdose can vary from one individual to another. It may be mild in some and severe in others. Several systems of the body may be affected. How is First Aid administered for Hydrocodone-Acetaminophen Overdose? 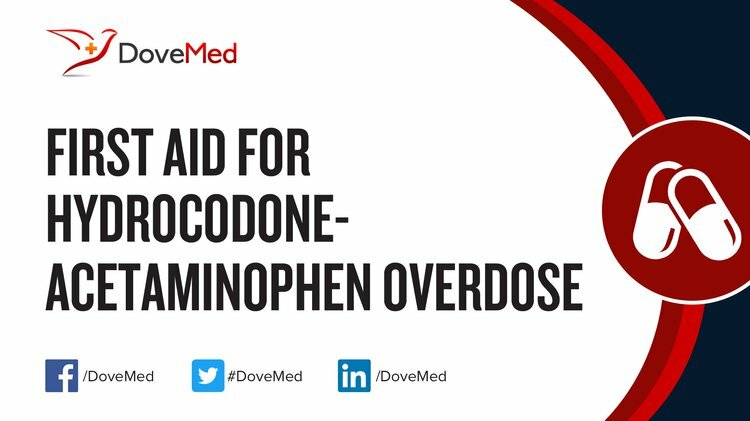 Who should administer First Aid for Hydrocodone-Acetaminophen Overdose? First aid for Hydrocodone-Acetaminophen Overdose is administered by healthcare professionals. What is the Prognosis of Hydrocodone-Acetaminophen Overdose? The prognosis is dependent on the dosage of hydrocodone and acetaminophen taken, time from overdose to start of treatment, severity of the symptoms, and general health and liver function of the patient. How can Hydrocodone-Acetaminophen Overdose be Prevented? Friedman, R. A., House, J. W., Luxford, W. M., Gherini, S., & Mills, D. (2000). Profound hearing loss associated with hydrocodone/acetaminophen abuse. Otology & Neurotology, 21(2), 188-191. Tang Ho, M. D. (2007). Hydrocodone use and sensorineural hearing loss. Pain Physician, 10, 467-472. Woodcock, J. (2009). A difficult balance—pain management, drug safety, and the FDA. New England Journal of Medicine, 361(22), 2105-2107. Osborne, Z. P., & Bryant, S. M. (2003). Patients discharged with a prescription for acetaminophen-containing narcotic analgesics do not receive appropriate written instructions. The American journal of emergency medicine, 21(1), 48-50. Michna, E., Duh, M. S., Korves, C., & Dahl, J. L. (2010). Removal of opioid/acetaminophen combination prescription pain medications: assessing the evidence for hepatotoxicity and consequences of removal of these medications. Pain medicine, 11(3), 369-378. Kuehn, B. M. (2007). Opioid prescriptions soar. Jama, 297(3), 249-251. Fenves, A. Z., Kirkpatrick, H. M., Patel, V. V., Sweetman, L., & Emmett, M. (2006). Increased anion gap metabolic acidosis as a result of 5-oxoproline (pyroglutamic acid): a role for acetaminophen. Clinical Journal of the American Society of Nephrology, 1(3), 441-447. Rodriguez, R. F., Castillo, J. M., Castillo, M. P., Montoya, O., Daza, P., Rodríguez, M. F., ... & Angel, A. M. (2008). Hydrocodone/acetaminophen and tramadol chlorhydrate combination tablets for the management of chronic cancer pain: a double-blind comparative trial. The Clinical journal of pain, 24(1), 1-4.